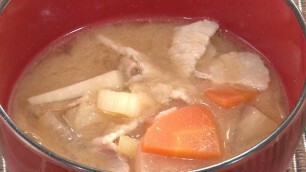 This recipe introduces TONJIRU that is a type of miso soup with simmered root crops. Recipes for typical MISO SOUP say that miso must be added after bringing vegetables to a boil. However, here we introduce a recipe for a type of MISO SOUP that is simmered for a while after adding miso. If TONJIRU containing pork and plenty of vegetables is complemented by some side dishes such as simple grilled fish and steamed rice, the dinner will fit perfectly for winter nights. The ingredients include giant white radish, carrot, taro root, sliced pork belly, green onion and pre-seasoned miso(miso is a kind of fermented soybean paste). If you do not have taro roots, potatoes can be used instead.